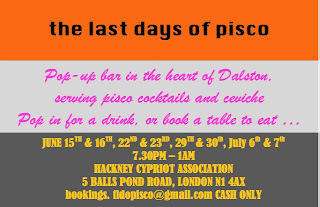 Coming soon in Dalston, for four Friday and Saturday nights. This place sounds great. "Most of us hadn't even heard of ceviche this time last year. The Peruvian dish of raw fish in a glug of lime with sea salt and a hint of chilli was probably something only known about by the more intrepid type of gap-year kid and a handful of serious foodies. Nowadays it's fetching up all over the show. 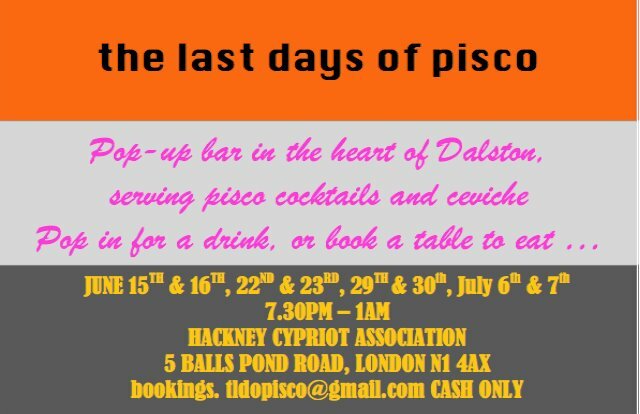 Ceviche in Soho kicked things off, but for those with less capacious pockets a new pop-up opens in east London next weekend and runs every weekend until 6 July at 5 Balls Pond Road. Raw fish not your thing? Head down for a pisco sour or three instead."